My own family’s stories, told to me as a child, were the first seeds of my emotional connection with the tragedy of war for both soldiers and those at home. One moving story concerned my great grandfather, Private Archibald Brunton, and his closest friend. Archibald’s friend was shot in the chest, the bullet passing first through the chocolate box in which he kept his sweetheart’s letters, before entering his heart. Archibald managed to salvage a few of the letters to return to the girl but kept the box, with its deadly hole, to spare her feelings. The family has it still. The idea of soldiers carrying letters, and sometimes objects from home, as treasured talismans, resurfaced as I embarked on writing this novel. 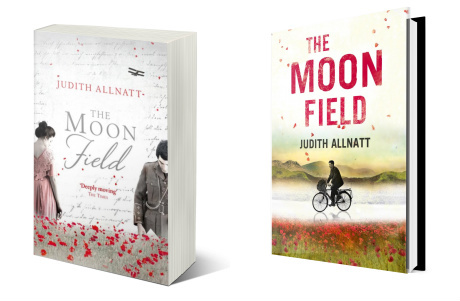 The Moon Field begins by placing the reader in the situation of opening a soldier’s tin box and finding his belongings: letters and photos tied with a bootlace, an ivory dance card holder, a pocket watch, an amber heart and a watercolour painting. We meet each of these objects in the course of the novel, starting with the painting. George Farrell, a young postman, carries it in his breast pocket as he cycles through the Cumberland fells, intending to give it as a love token to Miss Violet, the daughter at the Manor House. Before he has the chance, Violet opens a letter that shatters George’s dream and sends him on a journey into danger, far from all he holds dear. In 1914 young George Farell is a postman in the Cumberland fells, and he has fallen in love with Violet, lovely daughter of the Manor – they met when she was taking a photograph, and formed a tentative friendship based on their passion for art. But on the day George dares to bring Violet the gift of a painting, he discovers that she is in love with someone else – Edmund Lyne, glamorous brother of an upper-class schoolfriend. George joins the Army and finds himself serving in the same battalion as his rival, and gradually getting close to him. When George is wounded he goes home to Cumbria convinced that no woman will be able to love him. 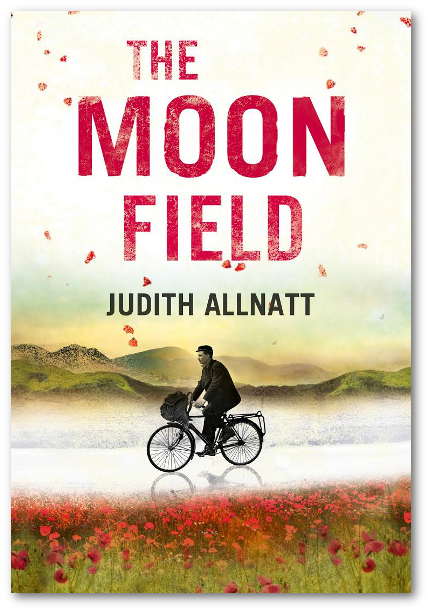 Allnatt is too good a writer to succumb to mawkishness or fall back on the usual clichés; The Moon Field is genuinely and deeply moving. 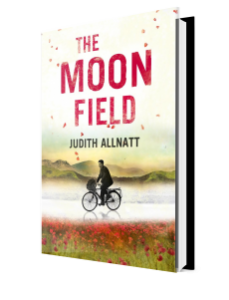 The Moon Field is a moving story of the innocence, joy and pain of young love and of a changing society in a world altered forever, told through understated yet powerful prose. 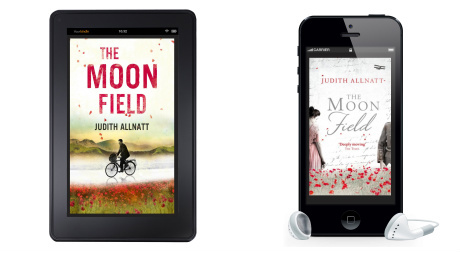 Judith Allnatt writes beautifully, with honesty and compassion the bravery of George in going to fight; the tragedy and futility he sees; his loved ones at home always fearing the worst but hoping for the best. This is a book about Britain in the Great War, and George, junior postman, his pranks as a youth, his infatuation and his hopes for love. In an extraordinary record of Britain at war, the towns, landscapes, people, commerce and industry are changed immeasurably from 1915 to 1919. This book details army trench life as well as the home life of a wealthy girl both loved by George and, by coincidence, his CO. At a well-observed gaming table, officers drink and gamble as poor George peels spuds. Shells bring dirt and plaster down, equally on them all. Amazing details of trench warfare, the wail of shells, and the rolling sounds of men taking cover in muddy “funk holes” are revealed. The terror of pain, the horrendous butchery in slime and mud give new slants on men’s behaviour under fire with fine telling of both feelings and sounds. I rejoice being in the first generation of British men never to have been forced to war. This masterpiece must have taken years to write, for it encompasses a vast resource of research and memories. The narration, though lengthy, is never tiresome, and introspection is as valuable here as dialogue. The ending is touching, as it should be, but holds one or two surprises. Watch a TV interview about the book with Nick Higham from the BBC News series ‘Meet the Author’.